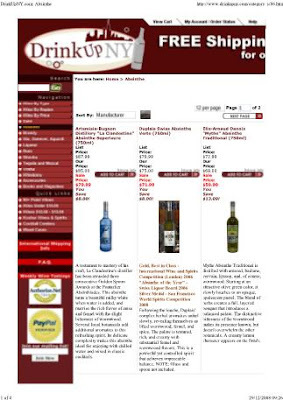 The webpages above are my photos of 2008: a year which saw the number of absinthes available from US retailers such as DrinkUp New York and Bevmo rise to double figures, and saw the list of US-approved absinthes rise to at least 37. 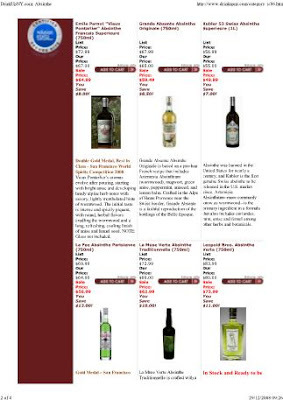 If my readers thought that 2007 was an interesting year for real absinthe, then heaven knows what they thought of 2008! By December 2008, about 25 of the approved absinthes were actually in the US market (or very close to being so). All this at a time when the USA enters its worst economic slowdown since 1929, with one major banking casualty, an auto industry close to bankruptcy and now with a ground-breaking new President-elect. So, given the plethora of new absinthes on the one hand and the recession on the other, what is really going on? And what will happen in 2009? might suggest that several of these aren't real absinthe, but that's another debate for another time! My forecast for the first Czech absinth to enter the USA has only proved wrong in that while four are now US-approved, none of them has actually entered the market yet. 3. One or two unlikely alliances between some of the main players will start to be seen. Consolidation is happening throughout the drinks business and absinthe will follow this trend. A year ago, would anyone have forecast that a brand like La Clandestine would be sold by the company selling Lucid? 4. Prices will fall, whether on the internet or in the retailers selling absinthe around the world. Some of this will come from greater production efficiency in the business and from greater competition; some will come from specification changes with suppliers reducing the alcohol strength as has been observed in at least one key market (the UK) in recent months. Some of this has proved correct, especially the effective prices (in dollar terms) from UK-based internet operators, although this is just a short-term foreign exchange phenomenon. Greater competition in the USA has yet to drive prices down, although there is now much more emphasis on value-added packs which has a similar effect. 5. More absinthe blogs will start (and many will wither); membership of the absinthe forums will continue to grow, and many of the longer-established members will tire of the inability of newcomers to read the FAQ's (that's an easy prediction)! However at the Louched Lounge, change will be less obvious! My forecast on new blogs has only come true if one counts the blogs on MySpace, and the demise of the Czech Absinthe blog was the main casualty over the last 12 months (with most other absinthe bloggers also a lot less active). A notable start-up is the Absinthe Review Network. The three main English language absinthe forums went in very different directions editorially, although in all cases visitor numbers seem to have stagnated or even declined. 2007 had ended with the USA’s first locally distilled absinthe since 1912 and some final vitriolic exchanges on the Czech Absinthe blog. Was it RIP or just “au revoir” to Absintheur and DrAbsinthe? 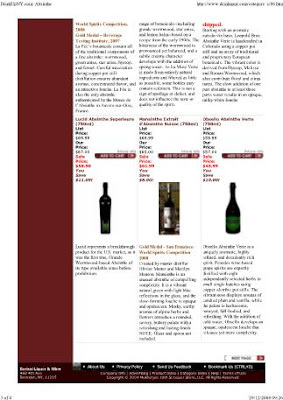 The growing interest in absinthe in the USA was evident with Imbibe’s review of the US absinthe market in January 2008. January also saw the TTB approval for Le Tourment Vert; February saw Grande Absente's approval; March saw La Fée Parisienne's approval. In April, Sign On San Diego broke the news that Tom Boyd (absinthe bloggist and inquisitor) was actually Dominik Miller, spokesman for Century “Absinthe.” Interviewed by the journalist, he invented the wonderful term “thujone denialists” to describe Ted Breaux and others involved in the emerging US absinthe market. 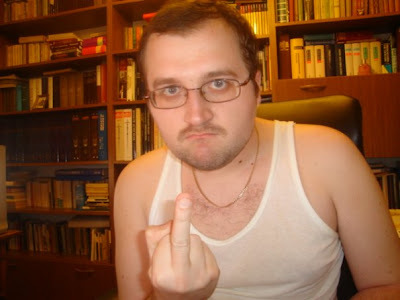 In truth, this spokesman for Century and others like him (who took upon themselves the task of arguing on behalf of all Czech “absinthe” with every real absinthe lover on the internet) have probably done more to harm the cause of Czech “absinthe” than anyone through continually linking it with high thujone. Hardly likely to help their cause with the TTB! Talking of which, in April Mata Hari and Sirene received their final TTB approvals, as did Leopold in May. June saw the 11th Annual Absinthe Festival in Boveresse, Switzerland. This year Claude-Alain Bugnon's webcam came into its own, filming those of us who were drunk-dialling the USA. Ted Breaux and Jared Gurfein of Viridian were at Boveresse in 2008, allowing some final fine-tuning prior to the announcement of the La Clandestine and Nouvelle-Orléans US launches. July is supposed to be the start of the summer holidays, but there was no sign of holidays at the TTB with Marteau, Obsello (the first Spanish absinthe in the USA) and Duplais all getting their approvals. 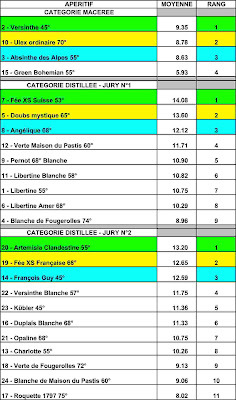 The pace barely slowed in August with Mansinthe and Vieux Pontarlier gaining theirs. September saw the Absinthiades in Pontarlier. For the fourth consecutive year, the Absinthe professionals of the world awarded Claude-Alain Bugnon the Golden Spoon for his Recette Marianne; for the second consecutive year the other distilled absinthe winner was La Fée XS Suisse (also produced at a small distillery in the birthplace of absinthe!). in New York (above), it was clear that the absinthe business is under-developed in the other major cities visited: maybe 2009 will be the year for absinthe in Canada? For me, October was significant as the month when La Clandestine was finally launched in New York, New Orleans, and Kentucky. It was also the month when the Beverage Tasting Institute of Chicago scores for nine absinthes became available. Members of the Wormwood Society were not impressed. Also in October, the Czech absinthe protagonist(s) returned. “Praha” debated absinthe issues in the National Examiner while “Ragnarok” followed suit in Newsminer. In both discussions, Hiram aka Gwydion Stone of the Wormwood Society was the target of the “thujone hypers,” and even if he didn't get the last word in the debates, he got the last laugh in life with the launch of his new Marteau Absinthe de la Belle Epoque. In November, news breaks of the first Czech "absinthe" approvals. The two brands in question are actually owned by two Australian entrepreneurs who used to work for Jim Beam: more "big drinks company" men coming into the global absinthe business. In late-November, La Clandestine started shipping from Nova Scotia. Most Canadians can now buy both Taboo Canadian Absinthe and La Clandestine Swiss Absinthe without having to pay high courier charges. And so as the global economy plunges lower in December, the TTB year ends with more approvals, including approval at last for Pacifique Absinthe. 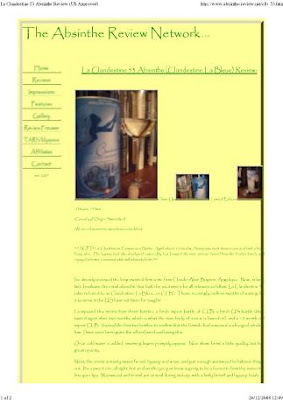 On Christmas Day, the Absinthe Review Network announced the highest-rated la bleue absinthe to date: La Clandestine. And 2008 ended with two dramatic developments: Health Canada confirm that they are reviewing their policy on thujone in absinthe: their review may take a year but it is the most positive news of the year for Canadian absinthe lovers (especially those in Ontario). And I pick up the first solid accounts of three global giants of the drinks business becoming interested in absinthe ... more of that later! Before my forecast for 2009, I want to make some new awards for achievements and services rendered to the global absinthe business in 2008. Absinthe Photo of the Year for the Drink Up New York absinthe page featured at the start of this article. for his two or more years debating firstly with the Czech absinthe bloggers/supporters, and more recently debating the Wormwood Society on Fée Verte. 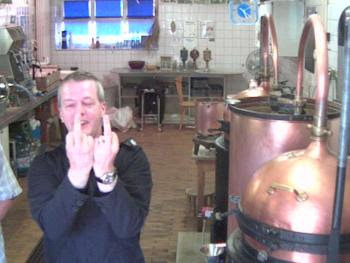 More importantly, he is a first-class spokesman for the absinthe industry in the USA, and I hope he is allowed to spend more time on that in 2009 (and that he will not need to argue in the internecine inter-forum war). Absinthe Launch of the Year award? In 2007, Lucid was the clear winner. In 2008, there is no clear winner. Pandor Absinthe hit the French market, Marteau hit some of the US market, and Stefano Rossoni's L'Italienne hit the internet shops. Obsello, St. Antoine, Prométhée, Vieux Pontarlier and Pacifique all look promising, but all lack the breakthrough impact of Lucid. So, all things considered, I have decided not to make an award in this category in 2008. 1. 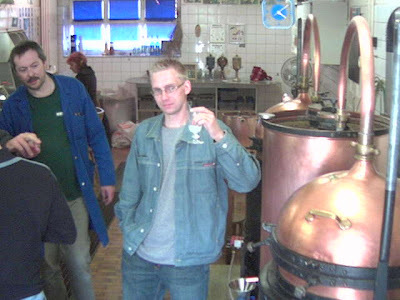 More multi-nationals will enter the absinthe market in 2009, probably through acquisition. With Pernod Absinthe gaining distribution in the USA every month, I cannot see Diageo ignoring this sector for much longer. And two separate sources have told me that they are looking very closely at this sector. Diageo generally buy their way into a sector through brand acquisition, and there are a number of acquisition candidates. A company of Diageo's scale would most likely want to buy an absinthe that can be easily "scaled up," which probably excludes most "hand-crafted" absinthes. If I was in charge of Diageo's acquisition policy, I know which brands I would be looking at, but there's no need for me to drive their prices up by naming them here! 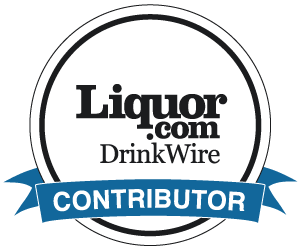 Which brands do my readers think a Diageo should buy? Bacardi, Brown-Forman and Fortune Brands are also possible absinthe purchasers, but might, on previous form, have other less obvious brands in their sights. 2. US absinthe prices? Impossible to forecast, with the forces of dollar depreciation and US recession/local production finely balanced. If the dollar falls to 1.75 against the Euro as some have predicted, then the price for absinthe imported into the USA could, theoretically, increase by up to 25%. 3. Absinthe consumption in the USA? Highly dependent on prices and the general recession, although there are those (myself included) who point to the good health of premium drinks in recessionary times. 4. Absinthe outside the USA. With the resurgence of absinthe (especially real absinthe) in the USA, bartenders around the world are looking at the sector with new interest. The bar trade in the UK, Australia, and Canada may be able to drive these markets away from the more artificial style of "absinthe" currently dominant there, but exchange rate issues may slow some of the demand. Looking globally, I see other markets in Europe and Asia Pacific as being more attractive, at least in the short- to mid-term. As an Asia lover now seeing bars in Thailand, Japan, India and other countries selling high quality absinthes, it is good to see that others seem to agree with me. 5. Internet sales to change dramatically. Already there are signs that absinthe shopping is changing dramatically. Example one: Absinthe-Suisse no longer ships to the USA. Example two: In December 2007, eAbsinthe sold 17 Swiss absinthes; 12 months later, they are only selling 4. With similar trends for other countries. Why the change? A few possible reasons spring to mind, such as the easier access to good access locally in the USA, cheaper local prices cutting demand on the internet, and, maybe crucially, the need of those companies now selling absinthe from Europe to the USA by the container, to appear to be moving to a 100% legal operation. In this situation, it is possible to envisage a time when all internet absinthe sales from Europe to the USA will cease. Maybe this is not the present that my US friends are looking for, but as Absinthe develops, why should the industry operate differently from Tequila or Vodka? Even if the world economy appears to be in free-fall, I forecast a great future for high quality absinthe. 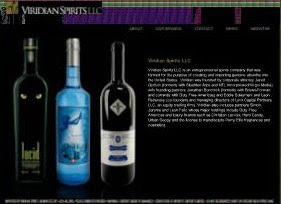 Even if 2009 is difficult, good absinthes which meet consumer needs will flourish ... in the USA and elsewhere. In October 2007, a bottle of hand-crafted Swiss absinthe cost about the same as 2 General Motors shares; in December 2008, that same bottle, with a lower price now it is available in US shops, would cost the same as 21 GM shares! Clearly, I don't want my readers to drink and drive: however, now, more than ever, is a good time to curtail one's driving habits, and switch to absinthe. But please drink responsibly! Finally, do my readers agree with my thoughts on 2008 and, more importantly, 2009?